My apologies for a recap of Anthropology 101, but it is necessary to understand what I mean by the title of this post. Anthropologists define political organization as the way in which a society handles the distribution of power, to maintain order which will enable the peaceful social and economic functioning of society. When this power is legitimized on the basis of culture/mores, it becomes traditional authority (as in a Council of Elders); and when it is legitimized through a modern legal-institutional framework, it is termed rational authority. In other words, if I have the power I can make you act in a particular way, whether you want to do so or not, and if I exercise authority over you then you must act in the way outlined, or face social and legal sanctions. The third element in this triad is influence – a far more subtle ability to make others think and act in a particular way, of their own volition. But how much of this much vaunted ‘power’ is real? Given the quirky electoral systems in both countries, the US Presidential race was won with just 46% of the popular vote; and India’s General Elections of 2014 gave the present government a great number of seats with just 31% of the electoral vote. Since then, Indian State Government elections have become vital to strengthen the government’s hands in the Upper House. 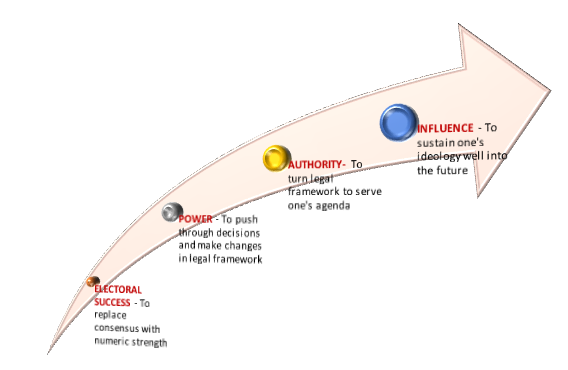 This is seen as very important, because the sitting government wishes to tweak the legal-institutional framework to enhance its authority in a way that will enable it to achieve its agenda before the next General Election, in 2019 – just as POTUS can affect the legal process there, by select appointments to the judiciary. Whenever there is an attempt to put the cart before the horse (assuming authority before legitimizing power) it falls flat – like the Trump travel ban and the hasty amendments to India’s Land Laws. I doubt whether both countries will allow their basic systems of legitimacy to be tweaked quite as easily as the incumbents seem to imagine – there are far too many checks and balances in both Constitutions, too many dissenting voices, too much inbuilt inertia, and rampant multiculturalism – the only safeguard for democracy in a globalised, multipolar world. However, there is a clear and present danger that until this much coveted legitimate authority materializes, there will be extra-legal efforts to intimidate and coerce, through the rewriting of history, the marginalization of immigrants and minorities, and the quelling of all dissent by questioning the integrity of all those who disagree – like the campus unrest in India and the media war in the US. It is again the bottom 20% in both countries who will bear the brunt of these ambitions. What is surprising is the convergence of vision between two such disparate leaders – one wants to make America great again, the other wants Development for all – but through the common route of infrastructure! This sector is globally acknowledged as the greatest source of corruption, and has been used in both countries to win elections – taking clientelism and crony capitalism to a new high : support today, profit tomorrow. 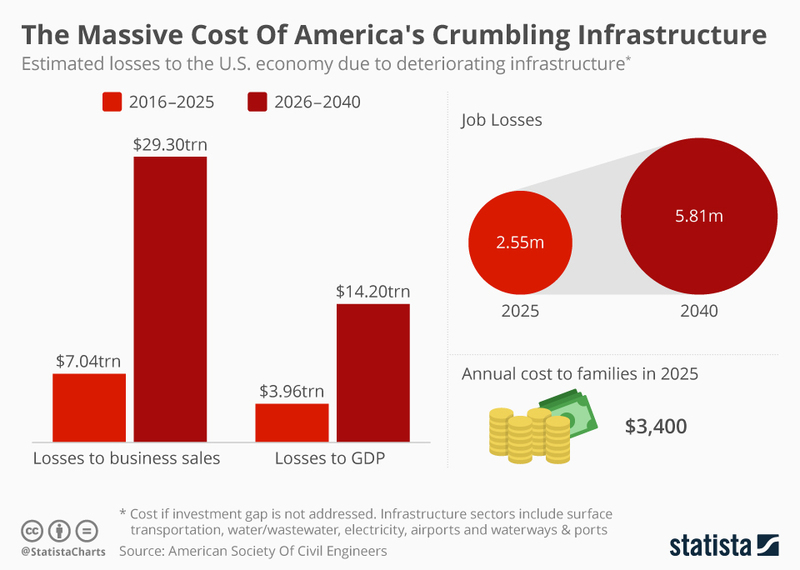 In fact the American Society of Civil Engineers has already submitted a wish list by outlining the horrendous costs to the country of deteriorating infrastructure, and the aspiring classes in India too dream of totally unviable and expensive bullet train networks criss-crossing their vast country. Infrastructure development provides both a carrot and a stick in times of elections: on the one hand, investment in physical infrastructure benefits large companies in the heavy engineering, construction and mining sectors, whose shareholders are among the richest and have the deepest pockets; and on the other hand, it keeps the recalcitrant and minorities in line through coercion – the highly centralized governance in India gives an immense advantage to the party in power at the Centre, and States that choose to go with other parties pay a very heavy price in terms of systematic deprivation of development funds. The price paid by West Bengal for voting in the Communists for a quarter century was huge – and Kolkata as the consumptive dowager metropolis of India is living proof of this, while Delhi was lavished with beautifying additions at the cost of other cities. Further, it is not only the cities but the rural areas which are impacted adversely if the Central and State Government are political adversaries. The Ministry of Rural Development gets the bulk of Government subsidies and aid, and antagonizing the powers-that-be at the Centre can dry up a river, create a famine, isolate a village, target a community, unleash a deadly epidemic, or devastate an eco-system. So as they forge new means to maximize the private profits from public investment in infrastructure, both countries will forget their shortcomings – like the world’s largest incarcerated population, child poverty, growing homelessness, deteriorating public schools, crippling student debts and unaffordable healthcare in the US; and the highest incidence of modern slavery, growing malnutrition, child labour, non-existent social security and rampant informalisation of the economy, in India.